Childcare is provided for infants and children through age three, during both our 9:30am class and 11:00am adult worship services. The educational emphasis is on self-discovery, building loving, trusting relationships and fun! Parents are always welcome to spend time exploring the nursery with their children. Our nursery is equipped with a crib/playpen, rocker, high-chair, books, movies and plenty of toys for active exploration. We celebrate the joy of God every Sunday morning at 11:00 am in our preschool classroom. Children ages 3-5 enjoy exploring and trying things for themselves. 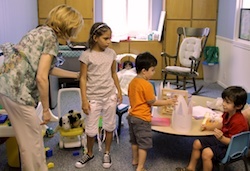 In an environment-loving acceptance, our preschoolers learn Unity Principles by seeing them demonstrated in lessons and stories that are shared. We learn that God is everywhere, loves us unconditionally and we learn to accept each other. We learn to meditate and pray. The Prayer for Protection with motions is a mainstay of our classroom. Activities for this age group emphasize exploration and the natural discovery of spiritual principles. Learning to see God in themselves and others helps the children to build strong, trusting relationships with other children and adults. We explore what Unity Principles are and how we see them at work in our daily lives. We use experiential activities in order to discover and use our natural gifts and the principles at the heart of Unity. Activities for this age group emphasize observation and purposeful questioning in the pursuit of an understanding of spiritual principles. Appreciation of diversity is a primary goal for this age group. When children learn to see with their hearts, they discover that God is alive, well and working through each of us for the highest good. Basic spiritual skills such as the use of affirmations, denials, prayer, and meditation are taught, alongside experiential lessons emphasizing direct personal experience and practical application. Currently, students in this age group have the option of serving as teacher aids for our Elementary Class or attending the adult service with their parents. 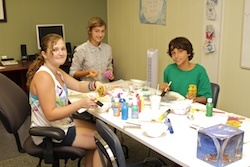 Additional offerings are currently in development for our teens.